Fresh, Clean, Earthy . . . . Yes, I was surprised by the color AND found the taste to my liking. It was fresh, clean and earthy. Also easy to use and a nutritional powerhouse. Mix it with Chocolate Hemp Milk! I like it in banana-yogurt based smoothies. Also makes a great smoothie with a cup of non-fat milk, 1T peanut butter, 1 frozen banana and a couple of ice cubes. 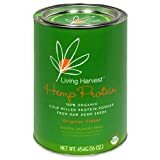 I had originally stumbled upon Living Harvest Protein Powder while looking for a substitute for an amazing 21 day cleanse/shake a nutritionist in SF had given me. Because the cleanse was so expensive to keep up, I asked for another high protein alternative that was less $$. She had told me to use Whey Powder so I bought it but was unimpressed. I wanted to have a healthy morning shake so looked a bit further and found the Hemp Protein powder at the Vitamin Shop and thought I'd give it a go. It is WONDERFUL! I drink this every morning with Green Super Food, Hemp Milk, Blueberries & honey. It has really changed my life. I have a ton of energy and don't feel hungry until more than an hour after my usual breakfast.